From the Warp: But those aren't "official" GW rules! But those aren't "official" GW rules! The question: What do you think about using variant army lists and Forge World rules in games of 40k? I'm not for using variant/Forge World lists against most opponents, and here's why. Wargaming gives complete strangers a firm context in which to meet and play. When this context becomes unpredictable then the rock on which the game is played becomes sand. FW/variant lists are not widely known (at least in my gaming circles) and there is no basis by which to know whether your opponent is playing fairly or loosely with their esoteric ruleset. This does not apply to a close-knit gaming group or a specific challenger, of course. If you already have a trust relationship with your opponent, or if someone comes to you interested in fighting your unique army, then go ahead and play them. It's like "house rules" in card games. Nobody joins a game with strangers expecting to use their own house rules. You use their house's rules, if there are any, or you play according to Hoyle. I personally don't have a problem with the variant lists/products from the Forge World line. A model is a model to me and if you want to try out a new rule set for fun, so be it. If, after testing, the new rules appear to be unfair/unbalanced, we'll talk it over and decide from there if we want to keep using them. Please keep in mind however, that I play in my basement with a group of friends. We don't do tournaments at this time and there is no exchange of prizes or money. If I was in a situation like that (say at a FLGS during a tournament) then I would have an issue if someone was bringing a potentially "broken" or unbalanced list outside of the GW rule set. When the majority of players see a FW model on the board they think they've instantly lost, which of course is insane. The rules for the lovely pieces of resin are actually fairly balanced, usually based upon existing rules written by GW. Sometimes I feel that the rules aren't powerful enough for the price you pay, and I think that's where people panic, thinking they do actually have awesome game breaking rules, when they actually don't. The army lists produced by FW also aren't game breaking, true they're not as playtested as much as GW lists, but do you ever see a FW variant list that is made to win? No, as they're meant to be themed and for narrative play. Mercer: I have an interest in people's perception of Forge World stuff/rules more so now than before because I've decided to start using it in my list. I actually sent this question out before I made the decision to start using FW rules in my army too so it's interesting to see people's reactions independent of my decision. Nice discussions ... Forgeworld models are an asset to the gaming environment as in the right hands they are both aesthetically pleasing and inspirational. They push the envelope of GW. That said, most are reasonably well balanced, but they're not really tournament play puppies. At the end of the day, any player who theme's his army around (say) the new XV9's would have an advantage as few people would be familiar. The easiest way to overcome this is to force all 'unique-unit' players to disclose their units beforehand. There's little difference between an XV9 battlesuit and some of the plethora of SpaceWolf unique characters... its all about familiarity - and sometimes a surprise is healthy - as long as its balanced. Personal opinion: I don't mind playing with or against FW models in friendly games at all. I even don't mind allowing most of them (except superheavy tanks, flyers, gar. creature and some gamebreaking models) for tournament use. For example: does the access to a blood slaughterer from the IA7 siege of vraks ruins the game? clearly not! 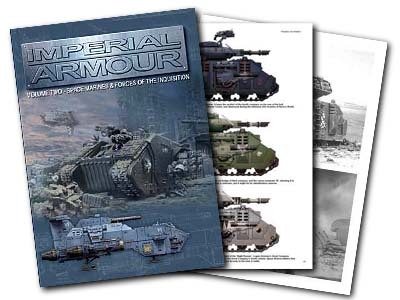 Does giving DH/WH or those old SM codices like BT access to cheap rhinos (and razorbacks), using the IA2 update pdf from the FW page, make the game a little more balanced? Hell yes! Does SM need access to a "I charge you with my poding ven-dread or ironclad in turn1" tactic, using the special and utterly broken dread-pod from the same pdf file? No, of course not. I played a testgame with a mech-eldar list incl. a night spinner tank against a SM list couple of days ago. Far far away from being game breaking. This weekend I will travel through half of my country for a tournament, organized by some friends of mine. 80+ players and you can use FW stuff (the staff still has the last word). Saw a couple of lists from their own members. Allowing FW surely increases the variety of lists. The game isn't balanced anyway. As a flyer, it is limited to Apocalypse or opponent's consent. I love Blight Drones, so I'm in favour of FW. Also, I think better looking models are a boon, not a curse... they should be embraced, not feared. I have used my Hierodule and Malanthrope in regular games and they're not unbalanced at all. I think they add a bit of variety. I'm confused. The last line of the article says "... they're meant to be themed, and for narrative play." Being new to WH 40k and haveing yet to play against anyone other than my son, but haveing been a player of another wargame for 20+ years, I dont see a problem, as long as you have the Book, or printed stat page for the piece(s) you will be using with you, so the others can see them. The FW models and rules are fantastic for friendly home games I find. As I'm not a tournament player I can't really comment whether they're "unbalancing" or not, but personal experience leads me to believe that they tend to take an inordinate amount of fire because "they look nasty". As far as variant army lists, there's good and bad in any home-brewed list, though for my money the folks over at the Tempus Fugitives website make some fun codexes for narrative/casual play that seem fairly well balanced. Of course, before using any of the non-GW/FW rules I ensure that my opponent has a chance to read through the rules and following the game we generally go over what worked, what didn't, what seemed unbalanced, etc. and come up with our own minor tweaks to ensure that the games are fun. ...And that's what most important in my book!